After an early morning court hearing in Athens, I ventured to Big City Bread Cafe at the recommendation of Take Thou Food. I really enjoyed this place's vibe, including all of the solitary diners reading newspapers and the cute courtyard in front. 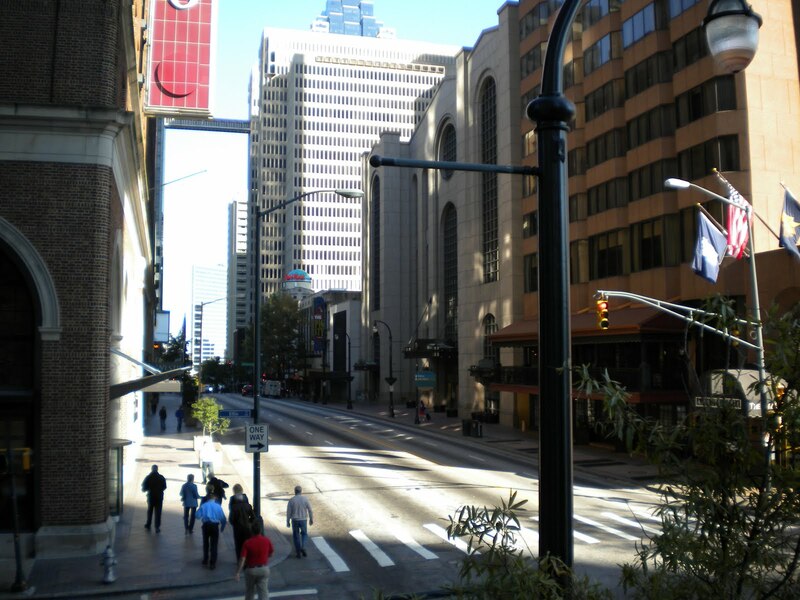 Everything I sampled was tasty - and it got me back on the road to Atlanta! I'd love to come here again for a more substantial meal 0r to purchase some of the delicious-looking bread, available in whole loaves for purchase. 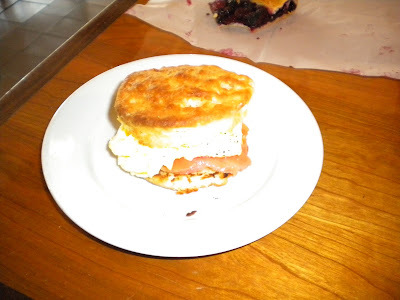 Smoked salmon and egg biscuit - it really hit the spot! Outside of the cafe there is a cute courtyard with tables. 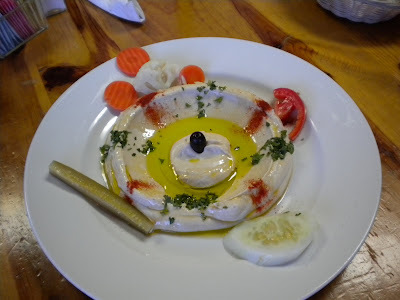 Kabob Grill's wonderful "Hommos dip". 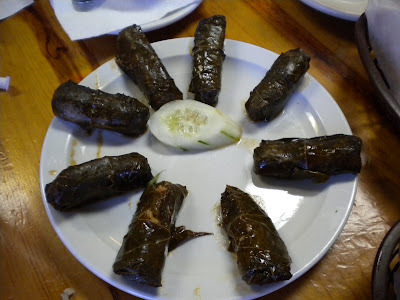 Kabob Grill is one of my Charlotte mainstays. 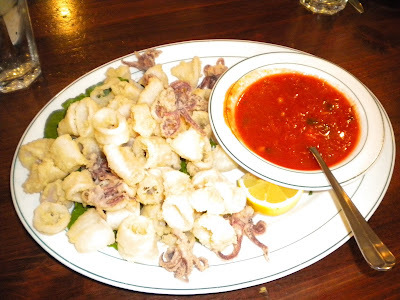 I enjoy the freshness and quality of the ingredients as well as the causal, laid-back atmosphere. The hummus (hommos) is really excellent here. 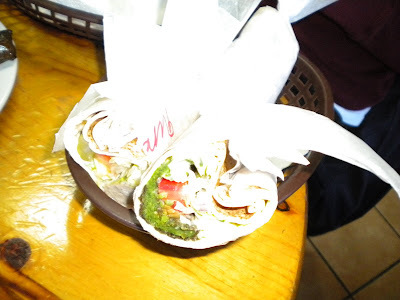 My other favorite dish is the lamb kabob wrap - really tasty. Over Thanksgiving I returned here with Calvin, my dad and a family friend - a great lunch choice! 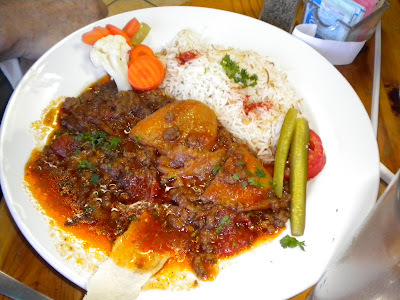 Daily special - ground lamb with potatoes and rice in a tomato sauce. 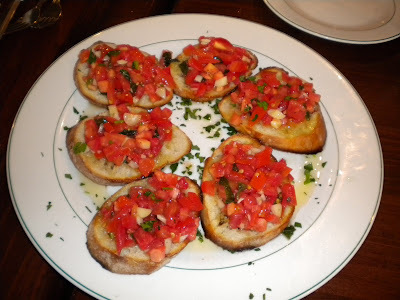 Bruschetta - delicious and full of garlic. 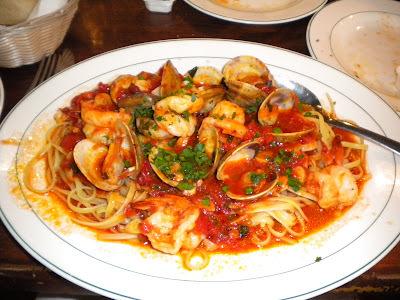 Shrimp Fradiavolo - my standby. 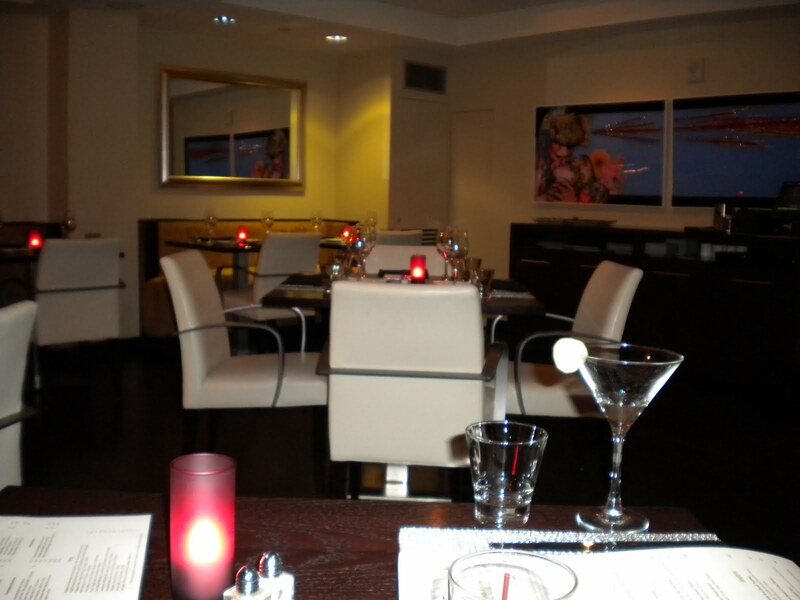 My favorite Italian place in Charlotte is Portofino. 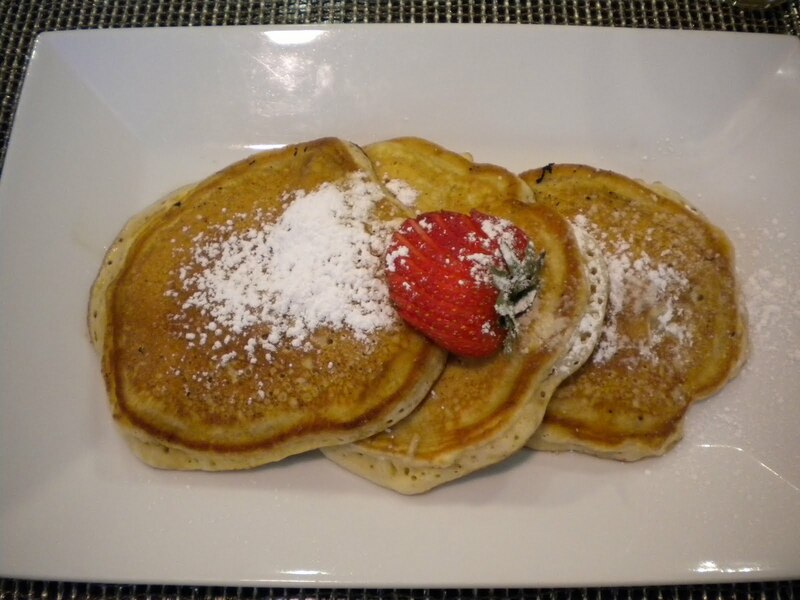 They have several locations including in east Charlotte and in south Charlotte on Park Road. The Eastway location is nostalgic for me as I went there on occasion as a youngster. The bread is fabulous - served warm with real butter. 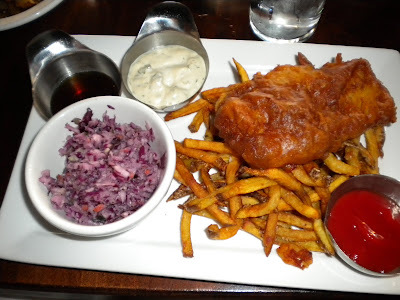 I also really like the orange colored dressing that they serve with their salads. 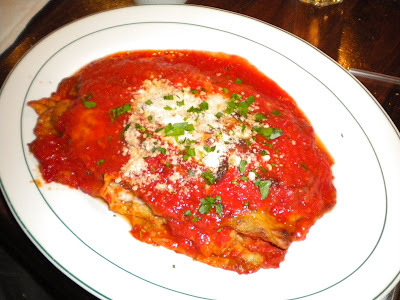 If you're ever in the mood for Italian in Charlotte, you should definitely give this a try. 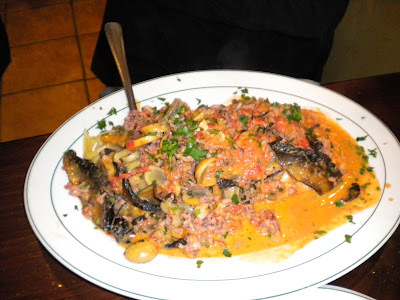 Salmon Mediterraneo - I was a bit disappointed with this - not sure what the bits of meat all over the dish are. 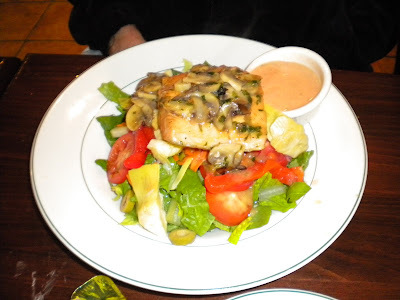 Grilled salmon salad with the delicious house dressing. 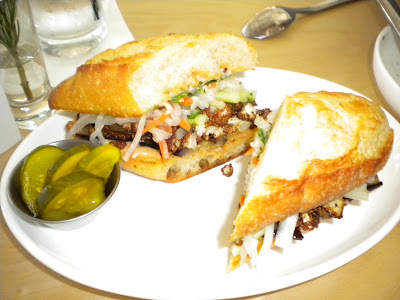 Roasted cauliflower, Chinese & Thai eggplant sandwich - awesome! After lunching twice at Bocado, once with a friend and another time in celebration of a birthday, I recommend this West Midtown newcomer. 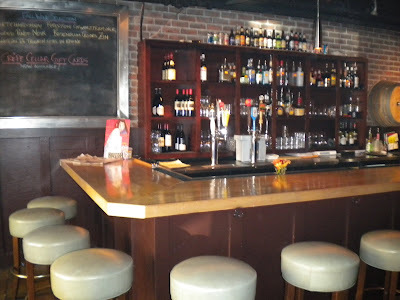 I really like the space, which is very open, with clean lines and a neat bar. Outside you'll recognize the place from the bamboo surrounding the building. 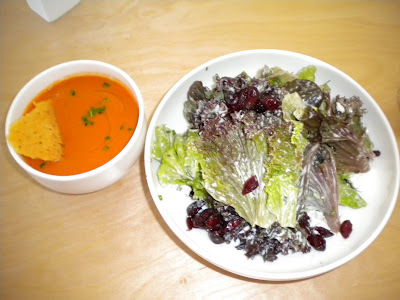 On my first visit a friend and I started with the wonderful tomato bisque and tried the deliciously simple young lettuce salad with cranberries and goat cheese. Then we split two sandwiches - the roasted cauliflower - which I adore and the pimento cheese fried green tomato sandwich without the bacon (my dining companion that day being vegetarian). Even without the bacon this is a rich, delicious sandwich. For dessert we tried the often mentioned chocolate pudding (photo below). 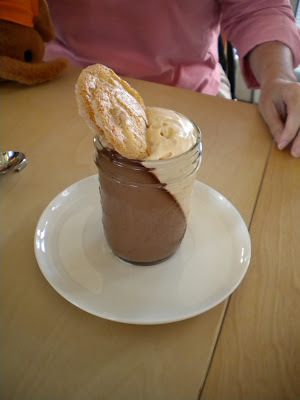 The term "chocolate pudding" doesn't do enough to describe it in my book - just try it! Rich tomato bisque with parmesan frico and young lettuce salad with cranberries and goat cheese. 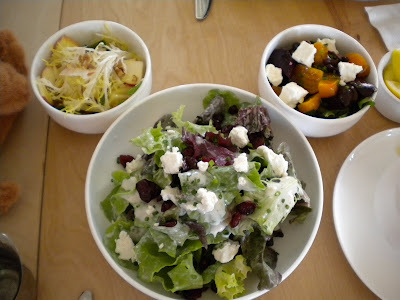 Apple raisin walnut salad, young lettuce salad (again) and baby beet salad. On my second visit I dined with my work family for our paralegal's birthday. Everyone enjoyed the experience and had a fun celebratory lunch. We tried two more of the sides/salads (above) & I was disappointed with their small size for the price and lack of big flavor - especially the apple salad. In fact, I think the price point here is a bit high in general. 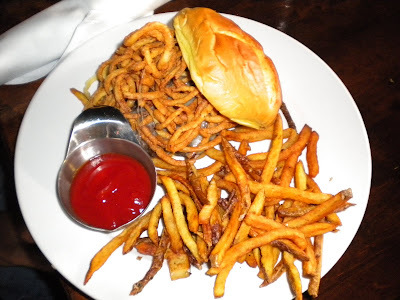 It would be really nice if the sandwiches came with fries or another side dish, but I like the food enough to come back again soon anyhow - still, I would come back more if it was a little more budget-friendly! 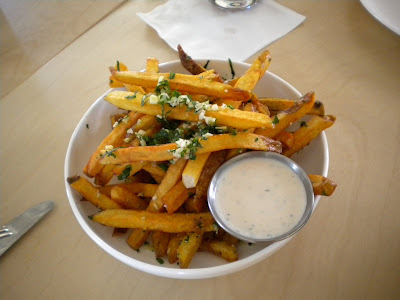 West Midtown is really flourishing, so if you haven't been you should check out Bocado and some of the other recently opened establishments. 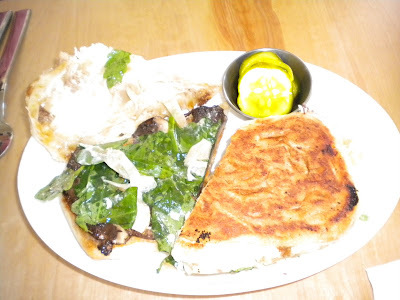 Portabello goat cheese panini. Very tasty - I stole a bite! 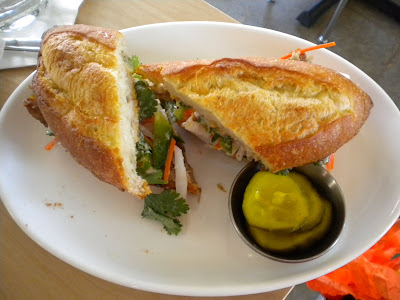 Bocado version of banh mi - Vietnamese pork sandwich. 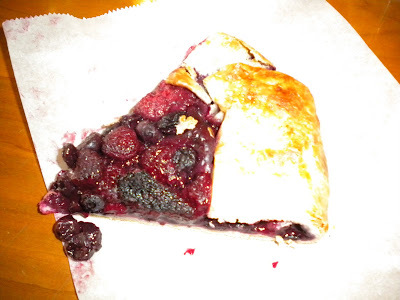 Pretty good but not worth the high price - you can get a great one on Buford Highway for $2.50 from Lee's Bakery! 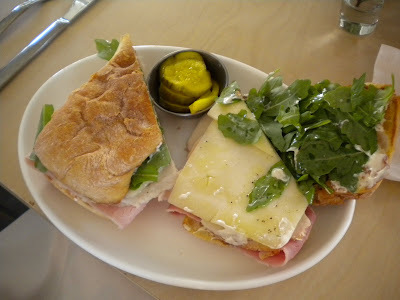 Roasted turkey breast and ham sandwich with gruyere and arugula. 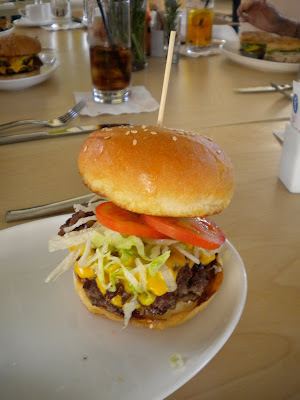 The famous burger. The two people who ordered it did not share. I take that to mean it was really good! Yours truly with executive chef Todd Ginsberg. 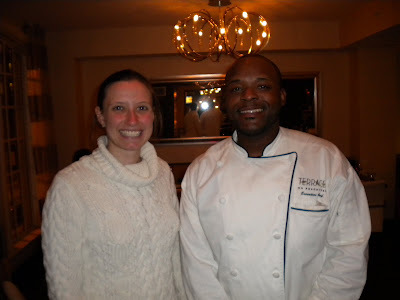 The chef as well as owner Brian Lewis were both extremely hospitable and personable on both my visits. I like when a chef isn't scared to come out of the kitchen! The chocolate pudding - a must-try. 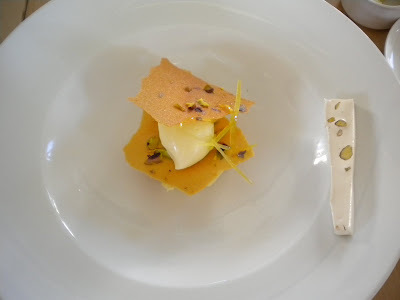 Lemon dessert with homemade nougat - also very tasty but not as conducive to sharing. 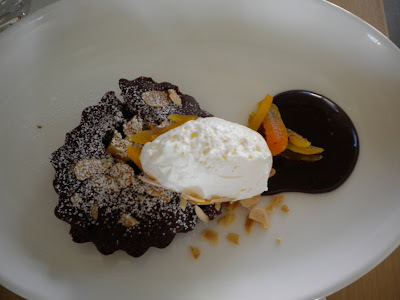 Dark chocolate tart with root beer ganache - so fun and yummy! While in Charlotte a few weeks ago, I tried out Crepe Cellar Kitchen for Sunday lunch. 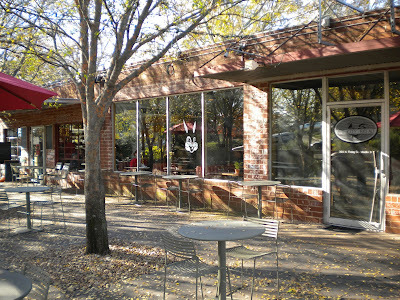 Located in the NoDa (North Davidson) district, this is a welcome addition to Charlotte's continuing culinary expansion. 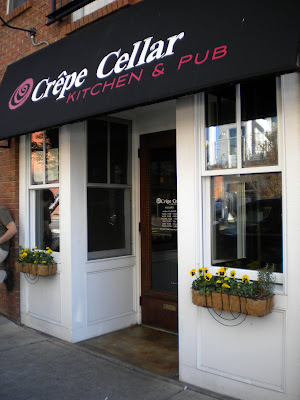 I really enjoyed my lunch here, especially the savory and sweet crepes. 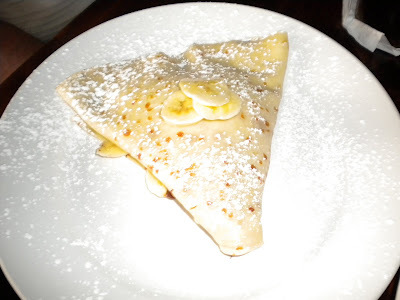 The butter sugar crepe is simplicity at its best and the Nutella banana a serious chocolate-lover's indulgence. I would definitely like to come back here, at least for dessert! 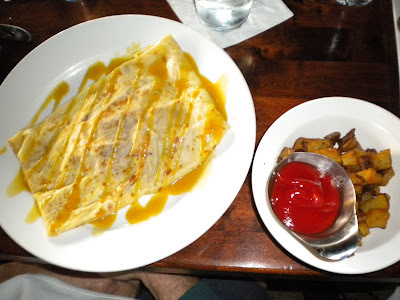 Ham and Gruyere Crepe with Potatoes. 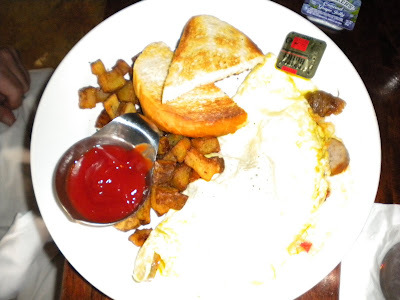 Special omelet of the day with sausage. 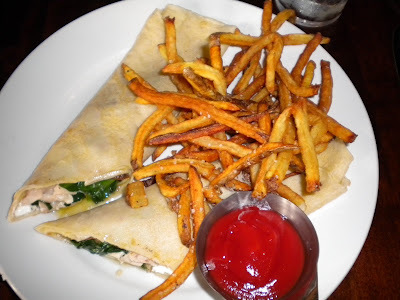 Spinach and wild mushroom crepe with goat cheese and chicken - very tasty. Nutella and banana crepe. We also tried the butter sugar crepe. 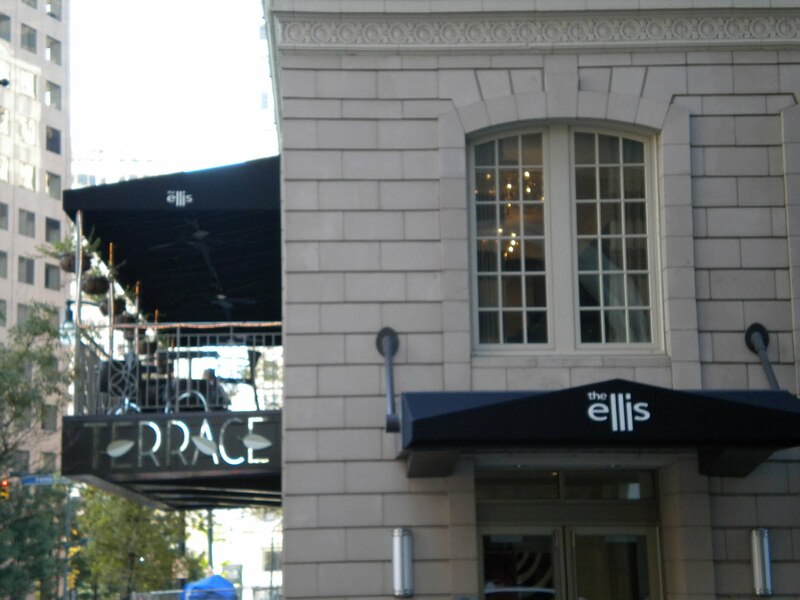 View of the Ellis entrace and the Terrace. Several weeks ago Calvin and I dined and stayed gratis at The Ellis hotel in downtown Atlanta. We arrived on a Friday evening just in time for the hotel's nightly wine tasting, which is included for all guests. This is a nice touch and allows guests to mingle and get to know each other a bit more than they otherwise might at this boutique hotel. 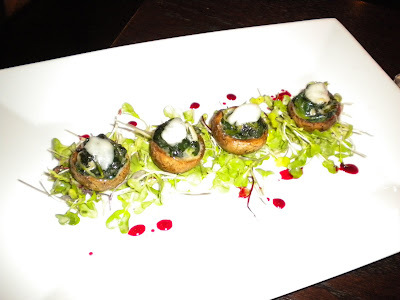 Stuffed Mushrooms with Blackberry Farms sheep's cheese and spinach - my favorite dish. 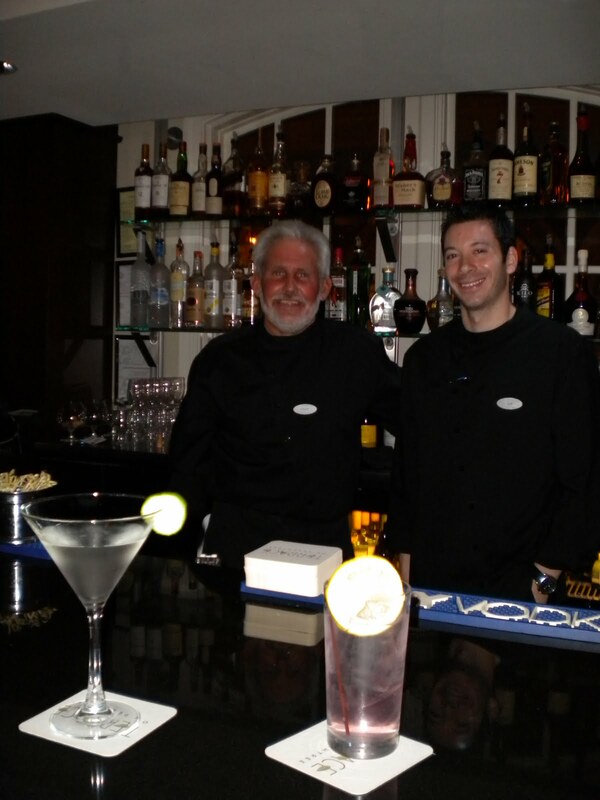 Bartenders with our drinks - the Hendrick Thatcher and the Pomegranate-Acai Lemonade. Shrimp & grits - grits were very creamy. We had a few drinks at the nicely appointed bar before being seated for dinner. 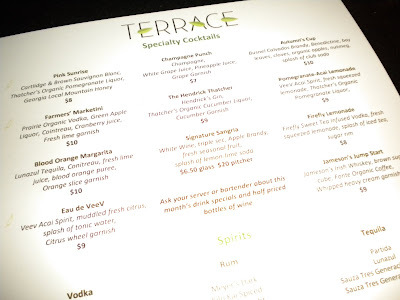 The drink menu is impressive, with 11 specialty cocktails. We enjoyed all that we tried, but my favorite was the Champagne punch = champagne, grape juice and pineapple juice with a grape garnish. Terrace crab cake with Creole mustard sauce. Kettle Macaroni & Cheese - also made with the Blackberry Farms Sheep's cheese. 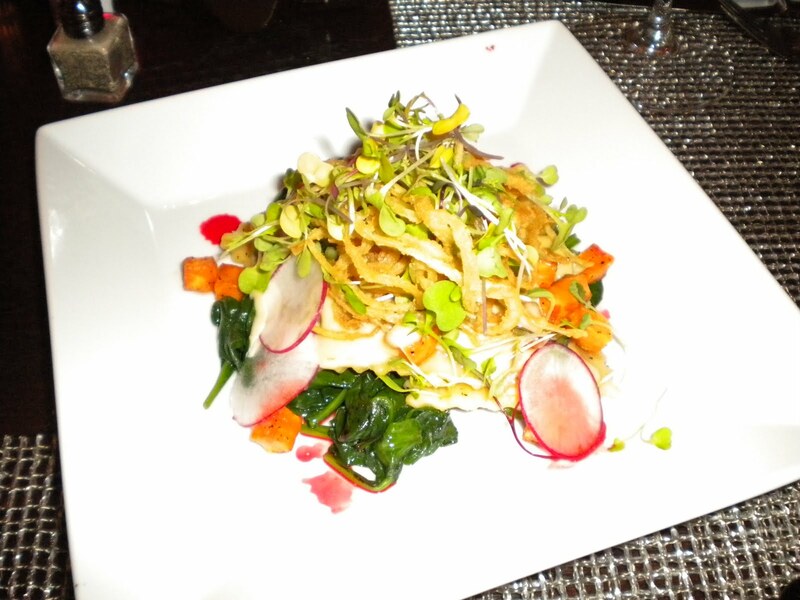 Overall I was impressed with the food's quality and presentation. When comparing it to other hotel restaurants, the Terrace at Peachtree is certainly a step above the usual and the emphasis on local and fresh food is inspiring and uplifting for anyone professing to be even partially a "locovore". 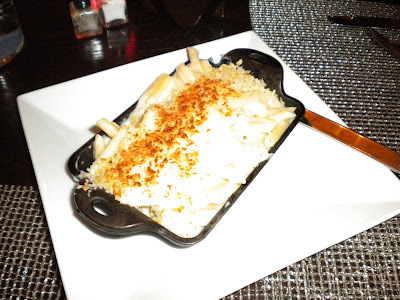 My favorite dishes we tried were the stuffed mushrooms and the kettle macaroni and cheese. Part of why I liked both of these dishes so much is the distinct, delicious taste of the Blackberry Farms sheep's cheese used in both dishes. They were also both really tasty and I liked the presentation of the mac and cheese in it's own little baking dish. 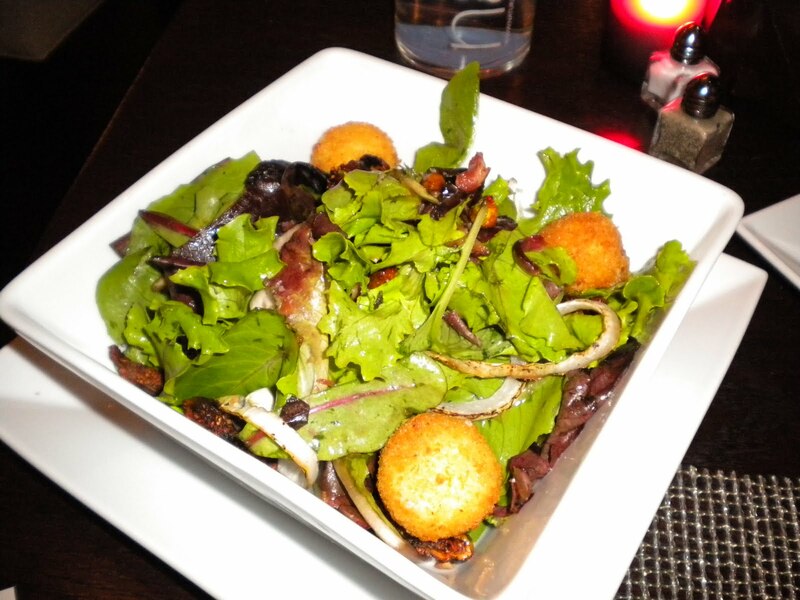 I also really enjoyed the fall salad (see below). I was, however, disappointed with a few things. 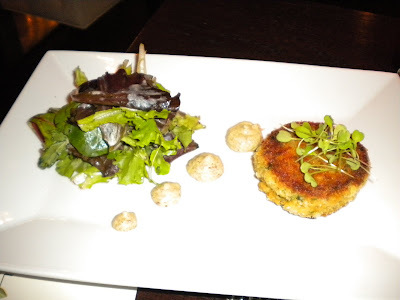 The crab cake didn't taste nearly as good as the best crab cakes I've had elsewhere, although I'm not sure what the exact issue was. Another problem I noticed was with oversalting. 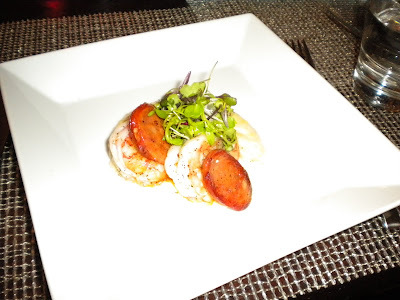 I found several of the dishes such as the sweet potato ravioli (which I expected to be sweet), the shrimp and grits and the crabcake to be a too salty for my taste. This is a problem easily fixed. Excellent fall salad with roasted figs, caramelized onions, bacon and fried goat cheese balls. 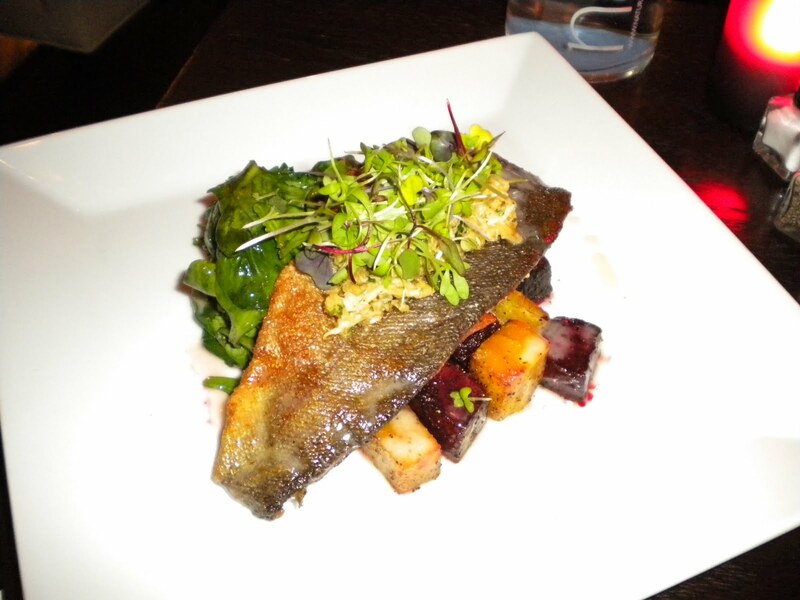 Enchanted Springs Georgia mountain trout atop roasted beets. Sweet potato ravioli with sage and roasted garlic cream sauce, drizzled with crispy onions. Roasted local beets with Sweet Grass Georgia goat cheese. 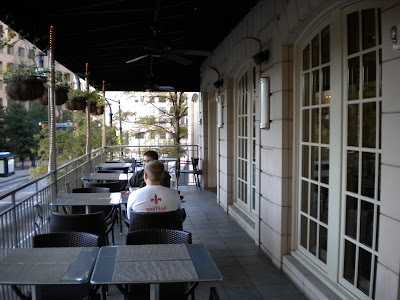 The Terrace is a welcome addition to the downtown scene and provides a good alternative to some of the overpriced, tourist-oriented places nearby. 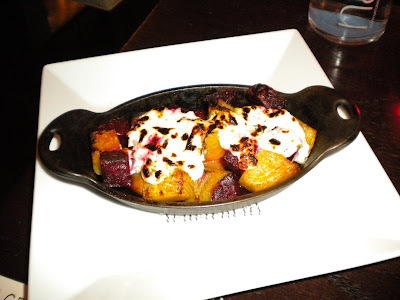 I also really like the chef's use of often overlooked ingredients such as figs and beets (and not just a beet salad - these beets were cooked and served warm in two preparations). 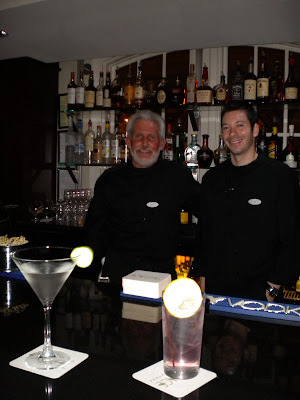 I should also mention that service throughout the entire stay was outstanding. Director of Operations Peter Minervini took great care of us throughout our stay and it showed that he really cares about the comfort and satisfaction of all guests. 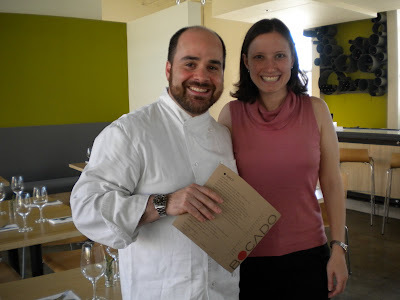 Amy with Chef Joel Young. 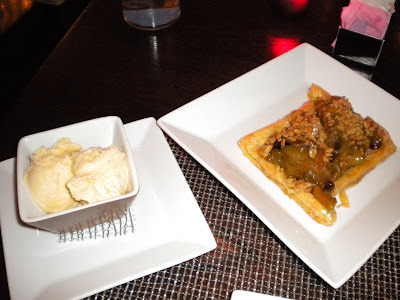 Spiced Apple Tart with butter pecan gelato. I loved the gelato, although it had a bit of a gritty texture. To me, that shows it was really homemade, which is more important to me than perfect texture! The tart was tasty but I think by the time we got to it we were too full to really enjoy it! I'd prefer to see another type of dough or crust used here rather than the flaky pastry, but that is a personal preference. I was very impressed with our room. From the specially outfitted mini-bar (with prices that are not as high as many hotels) to the luxury soaps and lotions in the bathroom to the fluffy towels and bathrobes, the hotel management has really thought out how to make guests feel especially welcome. The rooms have all been recently renovated, including the bathrooms. The bed was extremely comfortable. I want one! 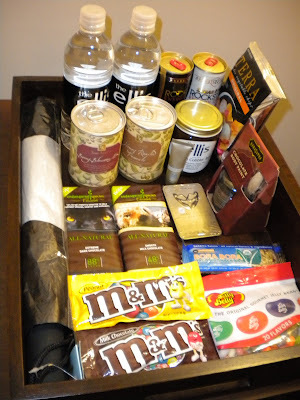 Deluxe mini-bar includes lip gloss and edible body paint. 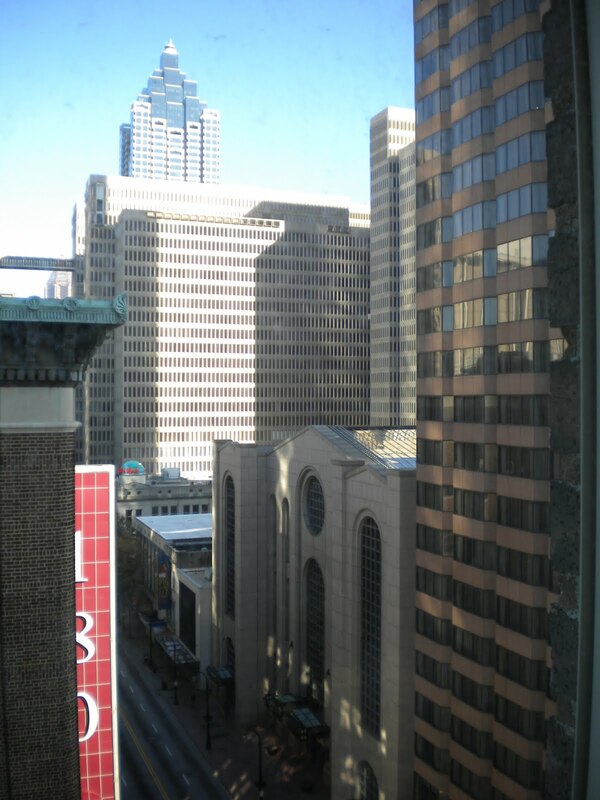 View from our 12th floor room. 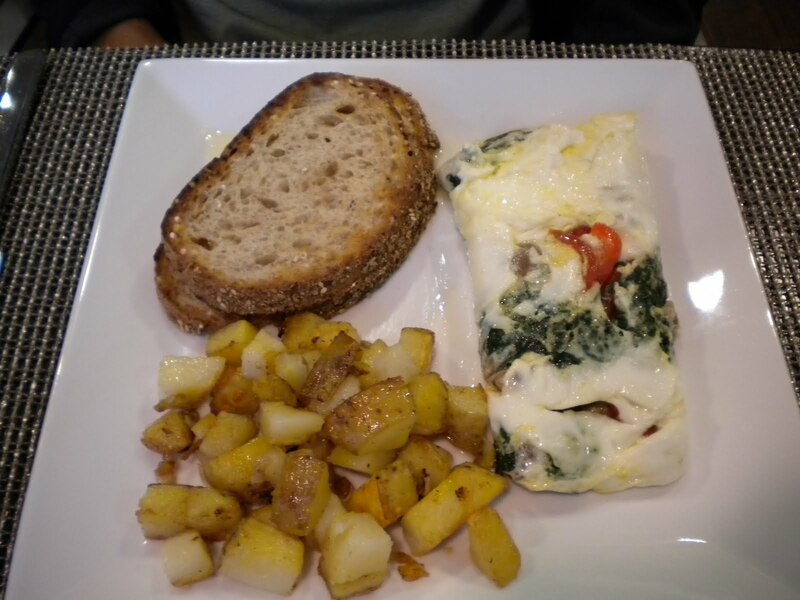 Farmer's Omelet with potatoes and toast. The next morning we were treated to a fine breakfast. The pancakes were tasty but the syrup did not appear to be pure maple - somehow I have a very discerning taste for that! Calvin's farmer's omelet was fresh and filling. Overall I really enjoyed our Ellis experience. 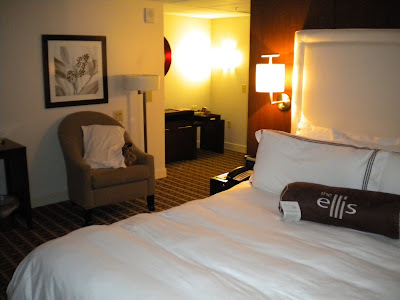 For Atlantans I'd recommend a "staycation" there any day and I definitely recommend the Ellis for out of town folks looking for a comfortable, reasonably priced hotel near some of Atlanta's most popular attractions. Thanks Peter, Chef & the Ellis team! We will be back! View from just outside the entrance.